Live Photos are a great new feature for the iPhone camera, and while you can easily share them with other iPhone and iPad users or to a Mac, they come across as little movies unless the user has Live Photo compatible iPhone. Mysteriously missing is the ability to convert and save Live Photos as an animated gif directly from the iPhone Photos app, but with the help of a third party application, you can convert any Live Photo into an animated gif with minimal effort. Before getting started, take any Live Photo with the iPhone camera that you want to convert if you haven’t done so already (you’ll need to enable the Live Photo feature if you turned it off). Very easy, here’s a Live Photo converted into an animated GIF of a fireplace that was created with the app. * GIF Toaster works well but has some limitations and some quirks in the user interface, so while it’s great for limited usage, if you plan on converting many Live Photos to animated gifs, you may want to try some other apps for Live Photo conversions, and the $2 Live GIF app or $2 Lively app are perhaps better choices. Nonetheless, for a free offering, GIF Toaster gets the job done well, and can also convert video to animated gifs as well. It’s worth mentioning that if you just want to make animated gifs from still pictures or videos, GifMill works great for that purpose as well, which is another free app for iOS we’ve discussed before. Animated GIFs are popular enough that the ability to generate one out of a Live Photo should probably be included natively on the iPhone Camera app or Photos app, perhaps such a feature will arrive in the future, but until (if ever) that changes, enjoy the apps to make your own animated GIFS! There’s a reason for that: live photos not only include the animated picture but also sound. Basically they’re compressed files containing a .png image and a .mov video inside them. You can separate the two files by importing into an app that can open zip and rar files -such as Goodreader- and share across platforms without any loss. 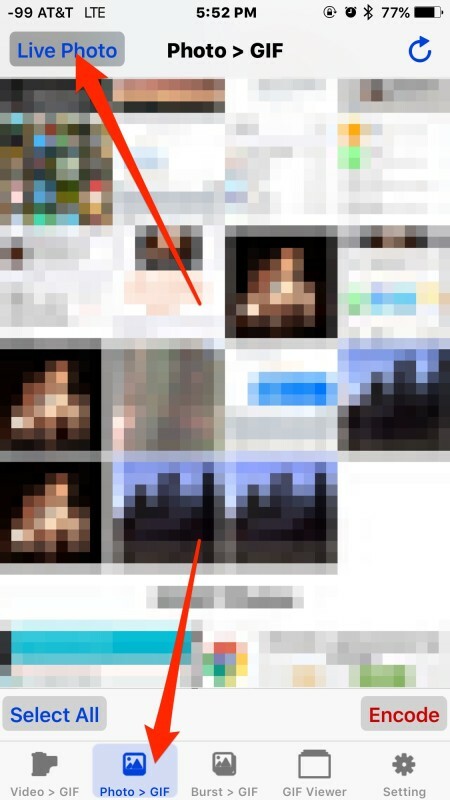 On the other hand, the Gifs are only animated pictures. You would lose the sound in the conversion. Just a note on my previous comment: that’s a .jpg image -not a png as I said before- and a .mov video contained inside the live photo files, which are stored as a compressed folders with a .pvt file extension. There’s also a third file in there called metadata.plist, containing the xml code that makes the animation play upon tapping and holding on iOS devices. What Apple needs to do is provide an “export” app or cloud-based export service that works with the Camera App. Here, this could allow a Live Photo or a video to be turned in to an H.264 MP4 video or an animated GIF. It could be tied in with their Mail Drop functionality which the iOS and OS X mail apps offer in order to allow a recipient to download a video clip or Live Photo that you sent as a QuickTime MOV, H.264 MP4 or animated GIF file. But knowing what Apple is like, they want to keep the best experiences within their devices. It’s even simpler. If they just let us share the .pvt file (see my other comments above), any app that can manage files and folders can be used to extract the jpg image and the mov video out of the live photo. Then we could share across platforms without any other special editing or converting tools or apps. Most windows and android devices can play .mov videos. I was thinking: you know what would it help? That, when you blog a article (e.g. Gift) before you recommend a ‘app’ check how bad are the ratings (who knows you might get it for free) to see that some of ‘Apple store’ or ‘developers’ should be ashame for alouding, crap apps on the store, well what do they care, they get 30% no matter what the crap.! Keep in mind that on an iphone 5s you cannot take live photos, that’s a 6s feature only. You can view them if it’s running ios 9 or later, provided that somebody else takes the live photo on a 6s and then shares it with you. This has an function to export picture directly to Gif. Thanks Jan I’ll give it a go! Check out Primo GIF, the light weight GIF maker, finder and social networking app @ https://itunes.apple.com/us/app/primo-gif-gif-maker-finder/id1059629485! We see many GIF finders and GIF makers out there, but no one has combined those 2 together, and further create a social network, so here we are. I found this one is the best so far. 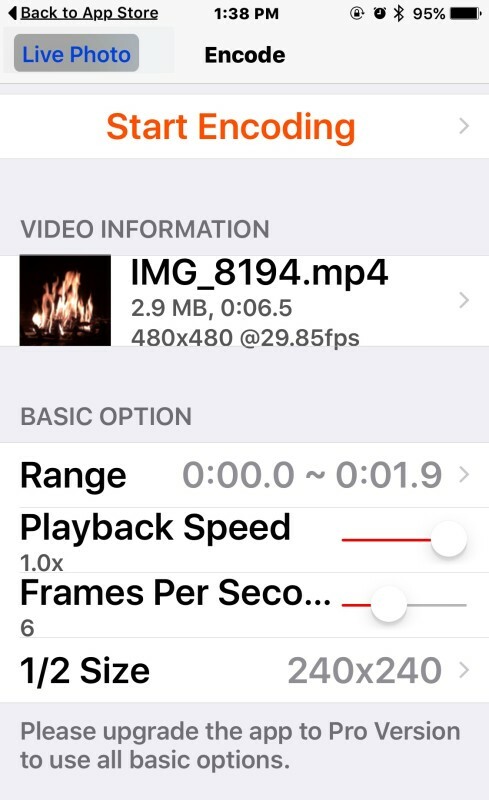 I use this app to convert GIF and video to Live Photo on my iPhone. You can also search GIF from GIPHY and convert them into Live Photo. Is there any such apps for laptop or only on smaller devices ? Thanks. Is there any such apps for laptop or only on smaller devices ? If Mac laptop can do it too, please advise how. Thanks.